A report of the Massachusetts Innovation Outlook Series. Released free to the 1500 attendees of the NSTI - Nanotech 2004 Conference and Trade Show, March 7-11, 2004, Boston Copley Sheraton. Free distribution by the NSTI through its on-line publication library and from the MTC web site. I just finished reading the report on my plane trip to CA. Fantastic and very dense. 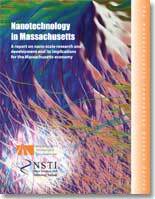 I think the nanotechnology perspective the report offers is scholarly and dead on. Congratulations. Doug Jamison, Vice President, Harris & Harris Group Inc.
© 2019 Nano Science and Technology Institute. All Rights Reserved.